In the robert Perry history of the NRO it is mentionned NASA interet for Corona in the Earth resources survey mission. Of course ERTS-1 become Landsat-1 and flew in July 1972. I wonder what kind of capability would Corona bring when compared to Landsat-1 ? I understand resolution would be far, far better, but remote sensing happens outside visible light - multispectral scans and the like. Landsat used Vidicon electronic signal cameras when Corona used film buckets. Perhaps they would build a hybrid of Corona and Lunar Orbiter / SAMOS, with the old Bimat system ? The problem with using a film-readout system is that you run out of film. It limits the lifetime. There's actually a decent amount of info on these proposals for turning over film systems to NASA. I don't know the specifics (I've forgotten), but I think that NASA lost interest. The film systems had a lot of capability by the late 1960s/early 1970s, but they were running into their limitations. Landsat and its technology approach had a lot more growth capability. Excerpts of 3 Photographic Interpretation Reports on KH-4A mission 1042-1 have been posted at https://www.nro.gov/Freedom-of-Information-Act-FOIA/Declassified-Records/Other-Public-Releases/From-the-NRO-Archives/. The Middle East Edition covers the aftermath of the Six-day war. 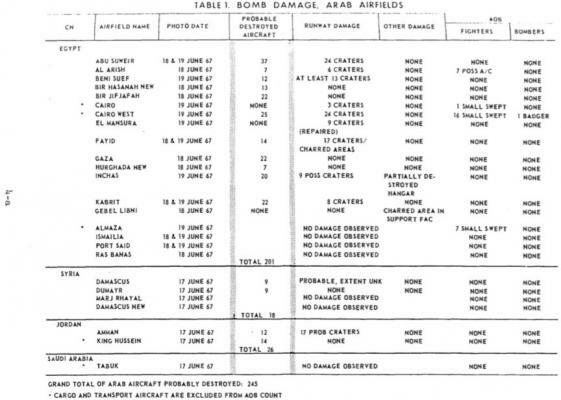 The summary table gives a good idea of the power of satellite reconnaissance (coverage of all major "Arab airfields" within 3 days). 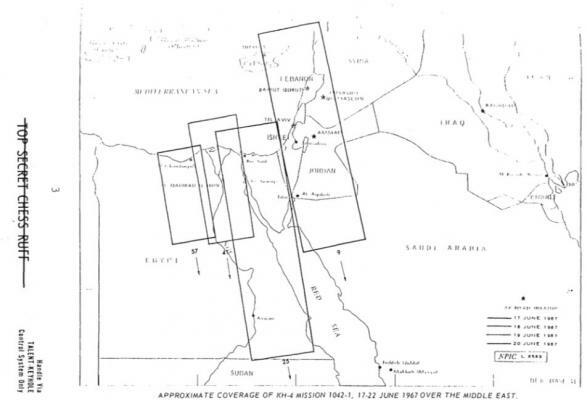 However, with the war starting on June 5, 1967, and the film probably not being available at NPIC for analysis before June 24 (mission 1042-1 ran from June 17 to 22), the growing demand in the late 1960s for the development of near-realtime imagery becomes quite understandable. This 2019 release as part of "sunshine week" is quite pathetic. Compare the number of documents released in 2019 (10) to the numbers for 2018 (50!) and 2017. Then consider that of those 10 documents, the 5 of them dealing with CORONA had previously been released, probably more than 15 years ago as part of the CREST program at the National Archives. Even the one you cite is not new. It's clear that they had to release something, but decided to release nothing of value. This is just a lazy effort. They're not even trying anymore. Such a rich history, but they're not even trying. Of the 10 released documents, 5 of them are previously-released CORONA documents. 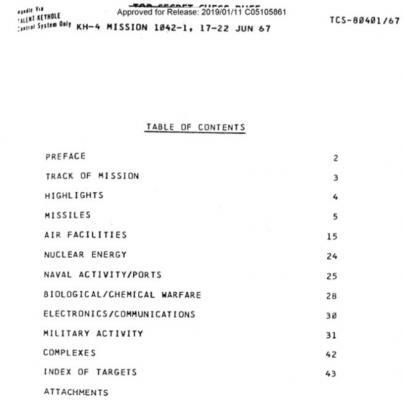 The two budget documents refer to the U-2 program in 1967, and we have so much info on the U-2 that I don't think there's anything of value here. This report was generated by Hughes, and it was never classified to begin with. So for the NRO to be releasing it as part of "sunshine week" is sort of like releasing a library book--it's not theirs in the first place, and it's not exactly notable. It refers to Hughes' then new spun/despun large geosynchronous satellite design, which was first employed with Tacsat. This enabled spinning satellites to be much larger than previous designs. But there's nothing unique about this technology or report, and it doesn't refer to an NRO satellite program. Now Tacsat led to Intelsat IV, and the first Satellite Data System was based upon that technology (if not directly derived from Intelsat IV). But that's not what this report is about. You get the sense from looking at this document release that they were required by regulations to release something, so they picked up a few random things they found lying around and just released those, without any regard to their actual historical value. Then they could claim that they did their job. Thanks for providing the context! Indeed, I didn't check to what extent these might be re-releases. 1-Thanks for providing the context! Indeed, I didn't check to what extent these might be re-releases. 1-Pretty much anything on CORONA has been released by now. I'm sure that there are some surprises stuck in boxes in a classified warehouse next to the Ark of the Covenant, but the CIA led the way on CORONA declassification years ago and continued it with the CREST archive, and I noted a drop-off in CORONA document releases over a decade ago, indicating to me that there was not much left. 1.5-The NPIC documents are not even NRO documents, they're NPIC. I'm somewhat curious as to how they ended up in an NRO document release, but my guess is that they were already declassified and so NRO was just putting their stamp on them and releasing them, because it didn't involve any new work. 2-I'm all for giving people the benefit of the doubt, but NRO is a DoD agency and should not have been affected by the shutdown. Plus, you'd expect that they would be working on this collection starting after they released the 2018 collection, right? In other words, losing one month out of 12 should not have resulted in such a pathetic release. The more worrisome possibility is that the powers that be no longer care about "sunshine week" and declassifying documents, and this could indicate that they're going to stop releasing documents. In that case, I actually had conducted an interview in the 1990s where somebody told me--quite accurately--about this 1967 visit. The NRO released a memo that confirmed that it had occurred and provided more details. It's not space-related, however. And we're still waiting for the third SIGINT material (the P-11 subsats).